The Duff Guide to Ska: Reggae Meets Ska V: Bigger Thomas, The Rudie Crew, Pidgin Droppings, and INI Mighty Lockdown! 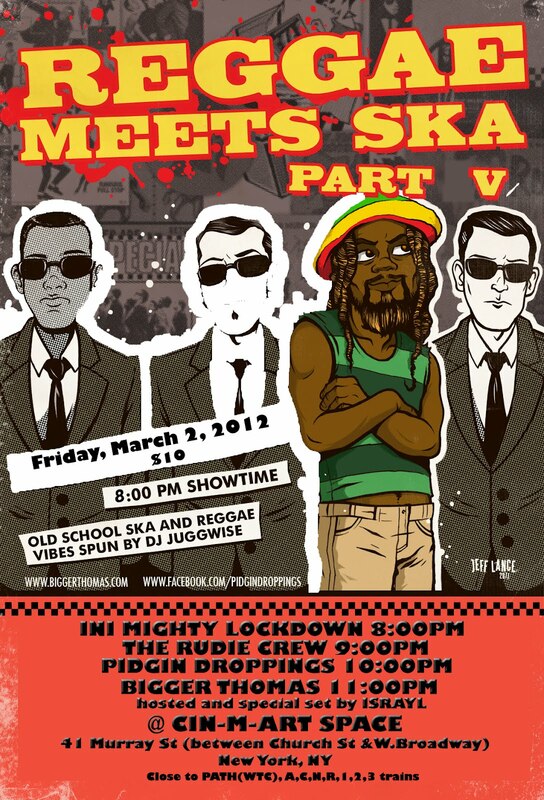 Reggae Meets Ska V: Bigger Thomas, The Rudie Crew, Pidgin Droppings, and INI Mighty Lockdown! 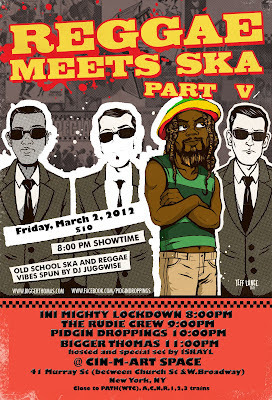 Not that I'm much of a big draw myself, but I thought I'd let y'all know that I'm going to be spinning some vintage, 2 Tone, and modern ska (thanks to DJ Juggwise who is sharing the decks with me and will be spinning some heavy reggay himself) at the upcoming "Reggae Meets Ska V" show on Friday, March 2, 2012 with Bigger Thomas, The Rudie Crew, Pidgin Droppings (NJ reggae), and INI Mighty Lockdown (Rockland County reggae). In addition to this being a fantastic line-up, the show's venue is located in downtown Manhattan (and easy to reach for both Jersey-ites and Brooklyn-ites via PATH or the 1, 2, 3, A, N, and R trains) at Cin-M-Art Space, 43 Murray Street (between Church Street and West Broadway). The show starts early (8pm) and goes late. Not a bad deal for $10. If you're in the NYC area, I hope to see you there! Hey, I Joined a Band! Madness Confirm San Francisco Date!